The number of jobs in the U.S. increased by 873,000 jobs in September, and the unemployment rate decreased from 8.1 percent to 7.8 percent. Coming as it does right before an election, this news has been met with skepticism on the part of those who don’t want the economy to improve. Among these of course is Fox. Never mind that the economy created 847,000 new jobs just this past January. Or that the economy lost 1,100,000 jobs in January 2009. I have the utmost respect for the Congressional Budget Office. That said, I might point out that Holtz-Eakin was chief economic policy adviser for John McCain’s 2008 presidential campaign and is now head of the conservative American Action Forum. 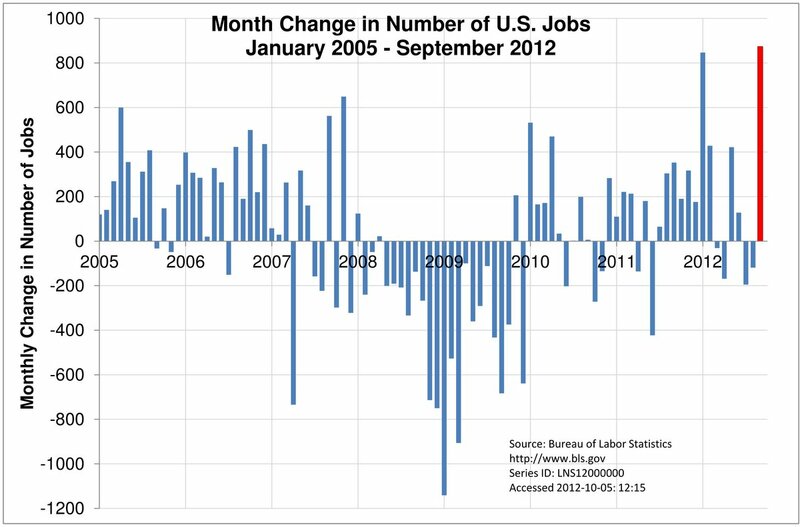 As a labor economist, I’m in a position to have an opinion on the jobs numbers. I’ve spent many, many hours poring over the detailed survey data that the Bureau of Labor Statistics produces. Just one month of Current Population Survey data is a 150 megabyte text file. I’m not saying it would be impossible to falsify something. I suppose nearly anything is possible. But the data is so detailed and complex that it would probably take 873,000 workers just to do it. And thousands of economics and business researchers scrutinize this data. Dissertations and journal articles rise and fall on it. To alter that data in a way that would fool the thousands of (often critical) researchers who look at this data in detail would be an incredibly difficult task. It would require so many people to be in on it that it would pretty much be impossible to hide. It’s a lot like open source software. The whole process is all so transparent that it’s nearly impossible to pull something. Admittedly, a lot of the new jobs were part-time, and we’d much rather have them be full-time. But part-time is better than none at all. No one’s hoping the economy will pick up more than I am, but, as I’ve pointed out in earlier posts, the Great Recession of 2008-2009 was unprecedented in scale and scope in the post-War period. It’s taking time to recover. But it could have been worse – much worse. If you doubt that, I refer you to the 1930s. I’ll confess that I haven’t yet dug into the details of the September 2012 labor numbers the way I have with some of the earlier data. But I will. And when I do, if I find anything odd or out of the ordinary, I’ll be the first to point it out. As an economist, I require – nay, crave – accurate labor data above all else. If there’s the slightest chance I’m not getting it, you’ll be hearing from me loud and clear. An opinion piece on the Fox website is calling for using the Labor Force Participation Rate (LFPR) as a gauge of economic health, rather than the Unemployment Rate. As a labor economist, I understand all too well the problems with the unemployment rates. I discussed some of these in an earlier post. As Fox points out, “The U-3 unemployment rate now hovers just over 8 percent. If those who have given up and have stopped looking for work were included, the unemployment rate would exceed 11 percent.” This is correct and is one of the biggest weakness of the U-3. It’s also why labor economists and others also like to look at the broader U-6 unemployment rate. I agree that during economic downturns, the LFPR may have some advantages over both the U­­­-3 and the U-6. The trouble is that if you’re going to use one measure during downturns, you also need to the same measure during expansions, and economies expand much more than they contract. And the LFPR has a lot of problems of its own, especially during expansions. The LFPR is heavily affected on the labor decisions of women, which in turn depend on women’s fertility decisions. If more women choose to have children, the LFPR goes down, even if those women are voluntarily choosing to have children because they feel positive about their future economic prospects. If more people choose to get more education, the LFPR goes down. Fox seems to imply that there are negative aspects to this, and that it should be discouraged. That doesn’t make sense to me. If more people choose to retire early because they’ve saved enough money and are tired of working, the LFPR goes down. Is this a bad thing? Or if people have to work until age 80 because their savings have dwindled, the LFPR goes up. Is this a good thing? There are many good reasons for people to choose not to work, if they are making this choice voluntarily. While the LFPR is an important measure that should not be ignored, using it as a primary measure would encourage a number of policies that would not be our best interests over the long term. 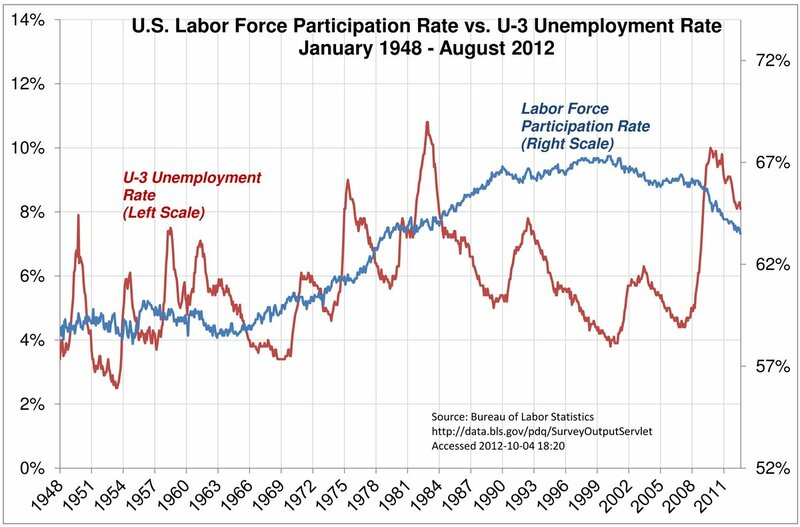 Here is a graph showing both the U-3 unemployment rate and the LFPR since 1948. Which seems to provide the most useful information about the economy? Warts and all, the U-3 and U-6 unemployment rates are still the best indicators of labor market performance. It’s not strictly speaking economics, but I was curious about how many times different words came up at the Presidential Debate on October 3, 2012. Here’s a summary of counts of selected words. This is based on the transcript from the San Jose Mercury News. This combines the words of Governor Romney, President Obama, and moderator Jim Lehrer. Behavioral economics is a hot field these days. It’s also a very cool field, since behavioral economists get to do actual experiments. Experiments are a relatively new thing in economics. You can’t very well run a random, controlled experiment on an entire economy, after all. “Let’s raise interest rates in 25 randomly-selected states and see how many people lose their jobs.” That sort of thing doesn’t go over too well, even when it’s not an election year. But behavioral economists can get away with this sort of thing, since they’re only messing with individuals. They can give two groups of people $25 and expose them to different situations in a controlled environment and see what they do. It’s fun. That’s the kind of stuff behavioral economist Dan Ariely does. In one experiment, he auctioned off bottles of wine and other products, but with a twist. Before making their bids, participants were asked to write down the last two digits of their social security numbers. You might ask, “What do social security numbers have to do with bidding on a bottle of wine?” And you’d be right. They shouldn’t have anything to do with it. That was the whole point. What Ariely found, however, is that people with higher digits bid more for the products, and people with lower numbers bid less. Those with the last two digits in the 80s and 90s bid an average of $37 for a bottle of 1996 Hermitage Jaboulet La Chapelle wine. Those with last two digits from 00 to 19 bid an average of less than $12. Those with numbers in the 40s and 50s bid an average of $18. 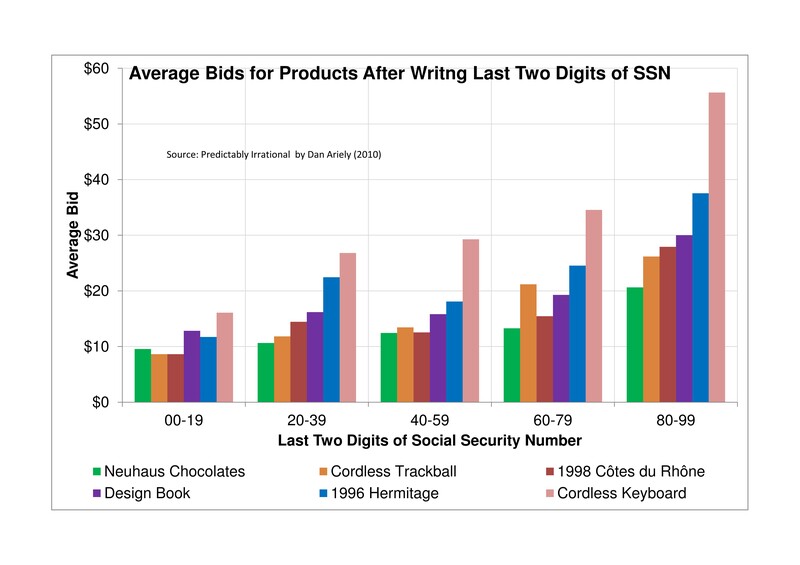 The same patterns emerged on bids for computer trackballs, chocolates, and other products. Just writing down and thinking about a completely irrelevant number changed how much money people were willing to pay for things. People don’t always rationally evaluate the costs and benefits of goods, selecting the ones that will provide them with the greatest utility at the lowest cost. The values that people give things are relative, and malleable, and at times arbitrary. So what? Why should we care about some obscure economics experiment? What difference does it make that consumers’ values can be easily manipulated? Actually, it makes a big difference. Much of modern economics is founded on assumptions that people on average make rational decisions about what to buy – or least act like they do. That they don’t consistently make biased choices. If consumers do behave rationally – and if a number of other assumptions hold – then free markets normally will work best by themselves, without any interference from governments or other outside entities. On the other hand, if consumers consistently make biased choices then a lot of modern economics is up for grabs. Violating the fundamental bases of economics could invalidate lots of free market theory, and open up the lots of potential for government policies that can improve economic outcomes. I still believe that most of the time, most people do behave (mostly) rationally without regard to economic decisions. That is, they don’t intentionally do things that make them worse off. But more and more, behavioral economists and others are finding exceptions, cases where people do things that just don’t make sense. Situations in which people consistently do things that aren’t best for themselves. Government interference in otherwise efficient and competitive markets is almost always a bad idea. And government involvement even in distorted markets has lots of costs and risks, and should not be undertaken lightly. But the more evidence we have that human are predictably irrational, the more potential there is that the right kind of government policies can make them better off. It’s interesting to read the comments for Wall Street Journal economics articles these days. 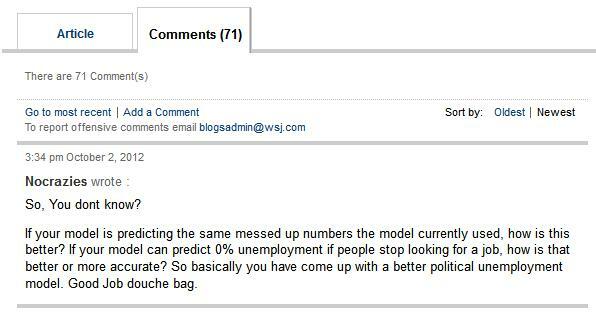 The loathing that WSJ readers feel for economists is almost palpable. The WSJ also has always had a somewhat conflicted relationship with economists. Economics encompasses a wide range of business topics as a matter of course. Economists often study businesses and markets and macroeconomies, and businesses often benefit from what economists tell them. And yet economics is not, contrary to popular belief, the study of business, or money, or stock markets. It’s a social science – a study of human behavior. And its conclusions and recommendations do not always favor 100 percent free-market, laissez faire, pro-business policies. Over the past decades, in fact, the conclusions and recommendations of economics have increasing found that the real world isn’t the simple, black-and-white place that we once believed. Humans aren’t as rational as we used to assume, markets aren’t as competitive, and free market outcomes not as optimal. In more and more situations, economists are finding that it is possible for the right kind of government involvement in markets to improve outcomes. Government involvement always has a cost, of course. Any government interference causes overhead and inefficiency and almost always has unintended consequences. Governments thus shouldn’t get involved unless there’s a really good reason to believe that the benefits of government will outweigh the costs. That said, economic research is finding more and more situations in which there is reason to believe that government can improve things. Business people tend to believe that any government involvement in an economy is bad for everyone, with the exception of specific measures that directly benefit their businesses or themselves. That’s understandable. Economists assume – rightly – that most people will act in their own self-interest most of the time. But that doesn’t mean they’re right. But I suppose it’s understandable that many business people feel betrayed by the increasingly-progressive bent of economics science. After all, when mainstream economists proposed using fiscal stimulus to combat the Great Recession in 2008, there was no widespread outcry against it. The main question was “How much is enough?” Ben Bernanke, the chairman of the Federal Reserve is a progressive experimenter, pushing for innovative ways of stimulating the economy through monetary policy. In short, mainstream economists are looking increasingly progressive. It’s no wonder many business people are angry at economists. They’re no longer the pliable allies that they once were. So I guess I shouldn’t be surprised at the scathing, critical comments of Wall Street Journal readers. Change is hard for all of us. But as your economist, I advise you to stimulate heavily. The unemployment rate in the 17-member Eurozone reached a record 11.4 percent in August 2012, according to Eurostat, the statistical agency of the European Union. This compares with a rate of 8.1 percent in the U.S. 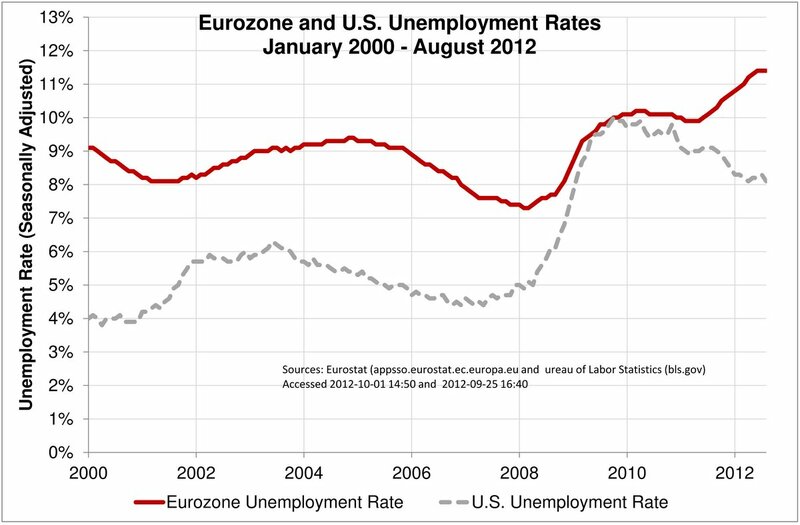 The unemployment rates in Greece and Spain were both near or above 25 percent when last reported. Portugal’s unemployment rate was 15.9 percent, and Slovakia’s was 14.2 percent. On the other hand, the unemployment rate in Germany was only 5.5 percent, and in the Netherlands only 5.3 percent. The U.S. economy has been flashing conflicting signals of late, with news zig-zagging up and down. Improvement here, weakness there. Good numbers one week, bad the next. They’re signs of an economy struggling to recover, but not quite able to get up enough momentum. So what gives? In case your memory’s a bit rusty, that’s Gross Domestic Product (GDP) equals Consumer spending (C), plus business Investment spending on buildings and equipment (I), plus Government spending (G), plus exports (X) minus imports (M). It may be a little naïve, but I find it a useful way of looking at the economy. Consumer spending makes up about 70 percent of U.S. GDP – it amounted to about $11 trillion in 2011. These days, consumers aren’t sure what to think, with signs of recovery in the housing markets overshadowed by persistently high unemployment rates. Talk of an impending student loan crisis isn’t helping. It’s hard to expect consumers to rescue the economy when their incomes are stagnating. Business spending on buildings and equipment only makes up about 12 percent of GDP ($1.9 trillion in 2011), but because it gets multiplied as it flows around the economy, investment spending is particularly important. Right now, businesses aren’t seeing consumer or international demand growing quickly enough to motivate them to spend more on expansion. This continues to drag the economy down, and there are few signs that businesses are going to power a strong recover any time soon. Government spending makes up 20 percent of GDP, or about $3 trillion. Contrary to most people’s beliefs, 60 percent of that, or $1.8 trillion, is at the state and local levels. 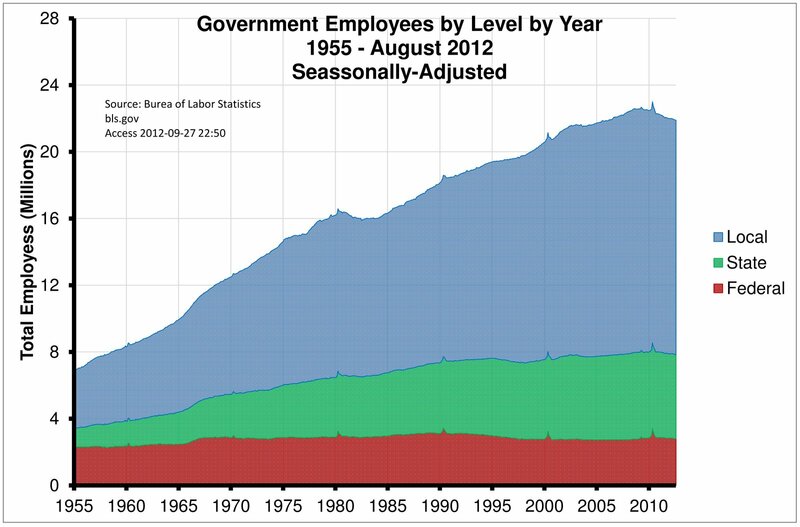 Reduced tax revenues caused state and local government to slash spending and employment, and total government employment is still down by more than 1 million jobs since its peak in April 2009. The looming Fiscal Cliff, a pending election, gridlock in Congress, and debt growing at unsustainable rates are all causing uncertainty and unease with consumers and businesses. Total exports were $2.1 trillion in 2011, while imports were $2.7 trillion, meaning net exports (exports minus imports) actually decrease GDP. Internationally, continuing problems in the Eurozone and concerns about China weigh on the economy as well. The net effect of all these factors on the economy as a whole is lukewarm at best. So what needs to happen? In general terms, we need for enough things to start going right to create a self-sustaining recovery, a critical mass of good things or good news. Enough cylinders firing to get the economic engine up to speed. How best to get there is up for debate. It’s possible – perhaps even likely – that the economy will eventually right itself on its own, without any interference. The trouble is that in the meantime lots of workers will sit idle, and many children may go hungry. A proven yet controversial solution would be to expand fiscal stimulus until the economy gets going on its own again. The problem there is that this requires expanding the federal debt even more. The Federal Reserve meanwhile has been doing what it can to stimulate the economy with monetary policy. However, there’s only so much more the Fed can do. Opponents also criticize any Fed attempts to stimulate the economy for fear of inflation, even though there are few signs that inflation is a real concern. For now, though, it looks like all we can do is sit, wait, and hope.